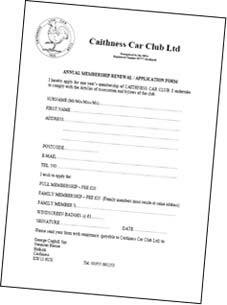 Caithness Car Club would like to welcome new members and welcome back existing members. To join the club this year, simply download the membership form, complete and attach the appropriate fee. To legally participate in Motorsport, you have to be a member of an MSA recognised club. Caithness Car Club are such a club and through which, you can join a host of other like minded competitors who race at the various tracks around the UK. In addition, you will receive discounts for entering many of our events, be included on the mail distribution list for our colour newsletters, have a chance at winning many of our club trophy's and be eligible to become a club committee member and help in the clubs decision making process.